Happy New Year to all! Hope the first five days of 2013 have treated you well - and that any resolutions that you made are still going strong! Mine are... doing okay, haha. One of them is to post on here more often - we'll see how well I can keep up with that! 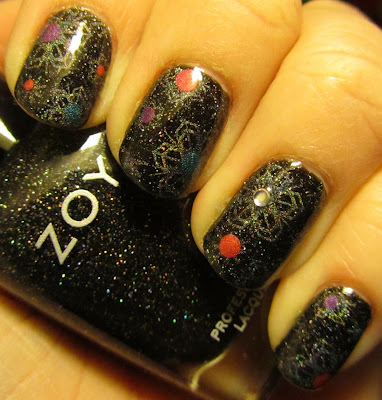 To start, here is my New Year's Eve manicure, featuring the lovely Zoya Storm. 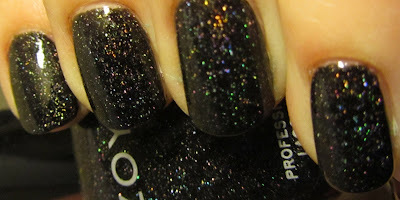 For these nails, I started with two coats of Zoya Storm, a gorgeous black with scattered holographic glitter. For images of Storm alone, see below. I added silver holo snowflakes using plate BM-323 and China Glaze OMG. While I loved that look alone (and sort of wish I had some pictures), I decided to play off of the bright colors of the holo glitter and add some colored dots to the center of some of the snowflakes. I used China Glaze LOL, TMI, and Techno Teal for holographic colorful dots. While I really like the effect of the purple and teal dots, the pink almost seems a bit too bright for the black and draws all of your attention. But I am still pleased with the outcome! I topped it off with a silver rhinestone in the center of the large ring finger snowflake. The holographic effect is intense and gorgeous. While slightly less holo than Aurora, against the black background is is really beautiful. This is probably my second pick from the Zoya Ornate collection, and my new favorite black holographic. I would strongly recommend it for the upcoming three-free deal from Zoya! I have lots of fun swatches, glitter layering combos, stamping and nail art planned for the upcoming weeks so keep checking back! I will do my best to keep up this resolution - good luck with any resolutions that you have made for 2013! I just LOVE Storm!! Aurora and Blaze rock too! So very pretty! Happy 2013! Storm is probably high up there on my list of favorite polishes ever! Elegant mani for the new year! !